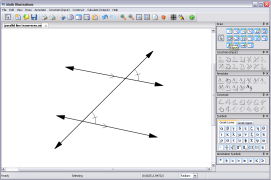 Tired of using the wrong drawing tools for your math documents? Do you spend more time using Word for line art instead of word processing? Are you left scratching your head on how to create an incircle in Paint? We were. And we did something about it. Introducing Math Illustrations, an easy intuitive way to create geometric diagrams for documents and presentations. By combining the constraint-based architecture of Geometry Expressions with easy-to-use drawing and graphing features, Math Illustrations lets you create more effective geometry figures for your students in less time. Quickly create drawings by using a constraint-based model. With a single click, add leader lines and dimension arrows to specify lengths, angles, distances and radii. 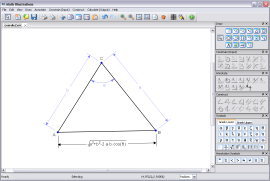 You can set the lengths of lines, value of angles, and size of radii in your figures. If side A of a triangle is length 4 and side B is length 6, you can be sure that side B is 1.5 times longer than side A. Draw a selection around your figure to place it on the clipboard in raster and vector format. Paste this directly into Word, PowerPoint, Photoshop, iWork -- you name it! We also support file export of EPS, EMF, PNG, JPG, Tiff and more. I really enjoy how quickly I can create diagrams with constraints. My students always ask ‘is it drawn to scale?’ and now I can answer "yes"! We gave Math Illustrations to the Minnesota State High School Mathematics League problem writing team to use on problems for the regular season and the state tournament.